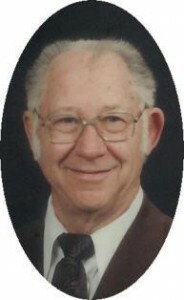 William C. Schuknecht, 87, of E. Whitefish Road in Port Washington died Monday, December 21, 2009 at Cedar Springs Health and Rehabilitation Center in Cedarburg. He was born in North Chicago, Illinois on February 17, 1922 to Roy and Bertha Neu Schuknecht. He graduated from Port Washington High School in 1939. He went on in school and graduated from the University of Wisconsin in Madison Law School. Bill served in the Aleutian Islands of Alaska for the United States Army during World War Two. Bill married Virginia “Jinny” Schultz of Sheboygan, Wisconsin on June 14, 1946 at St. Mary’s Church in Port Washington. He was the Past President of the Port Washington Savings and Loan, which was founded by his father and partners. When the Port Washington branch was sold to First Financial, he became Vice President and retired in 1990. He was a member and past Commander of the Van Ells – Schanen American Legion Post 82 in Port Washington, the Port Washington Rotary Club, Knights of Columbus Ozaukee Council 2035, past board member of the Wisconsin Boy Scouts, 24 year member of the Port Washington Planning Commision and member of the Wisconsin Bar Association for over 50 years. He is survived by his children Jerry Schuknecht of Port Washington, Judy (Loren) Kaye of Adams, Wisconsin and Carol (Novi) Novshek of Port Washington. Further survived by grandchildren Justin Novshek, Ian Novshek and Carissa (Michael) Burback, brother Robert Schuknecht of Saukville, sister Elnor Hecimovich of Madison and sister-in-law Dorothy Anderson of Clermont, Florida. His wife Jinny preceded him in death February 25, 2004. Also preceded in death by his son David, daughter Janet and sister-in-law Kathy Schuknecht. Fr. Patrick Wendt will celebrate Mass Of Christian Burial 7 pm Tuesday, December 29, 2009 at St. Peter of Alcantara Catholic Church, 1800 N Wisconsin Street, Port Washington. Interment parish cemetery. Visitation 4 – 7 pm Tuesday at church. Memorials to the Alzheimers Association or the American Diabetes Association.